A pilgrimage to see Wilson’s Bird-of-Paradise. The islands of Batanta, Salawati, Misool and Waigeo are also home to Red and King BoP, Northern Cassowary, Western Crowned-Pigeon and much more. Wilson’s Bird-of-Paradise; Red Bird-of-Pardise; King Bird-of-Paradise; Northern Cassowary; Western Crowned-pigeon; Pheasant Pigeon; Black Lory; Beach Kingfisher; Bruijn’s Brush-turkey. The islands of Raja Ampat are accessed via Sorong on the mainland. There are four main islands: Batanta, Salawati, Misool and Waigeo, but a trip to Batanta and nearby Salawati is usually enough to see all but Bruijn’s Brush-turkey. Birdwatchers usually base themselves in the village of Walibed on the south coast of the island. From the guest house run by the village there is easy access to some great birding. A short walk inland brings you to a large clearing which is an excellent spot to watch for parrots and pigeons in the morning or evening. It is also the spot to look for Red Bird-of-Paradise as there is a display tree nearby. Beyond the clearing the land rises steeply into forest. A walk through this forest towards the ridge above brings you to a number of display grounds of Wilson’s Bird-of-Paradise. Local guides have built hides around several of the grounds, so an early morning walk in will almost always reward you with spectacular views of these amazing birds. The island of Salawati is a short boat ride from Walibed on Batanta. There are several birding sites on the island. These include an area of swamp forest almost immediately opposite Walibed, which is home to King Bird-of-Paradise and has Northern Cassowary present. An alternative site for both these species, plus Western Crowned-Pigeon is a slightly longer boat ride to the west side of the island. The swamp forests in this area are more extensive and less disturbed. The crowned-pigeon can be seen in the forest and occasionally foraging along the edge of the beach in small groups. Further east along the channel separating Batanta from Salawati there are a group of small ponds just behind the beach which can be good for ducks and Western Crowned-Pigeon is also occasionally seen. No details yet. Have you been birding here? Would you like to add some details? Email us or post your advice below as a comment. The nearest airport to the Raja Ampat islands is Sorong. From there a boat is needed to get to Batanta, Salawati or any other of the islands. An easy, but generally expensive, option is to charter a boat for the number of days you plan to be exploring. This has the advantage that you can pick and choose where and when you want to visit different sites. To arrange a trip on public transport is more difficult, but possible. The best bet for either option would be to ask around for a boat or ride at the port in Sorong or on adjacent Dom Island from which small boats serve the offshore islands. For Batanta and Salawati the best base is probably Walibed on Batanta. The village here operates a simple guesthouse and can provide local guides to visit the birding sites inland. To visit Salawati is easy if you have chartered a boat, if not you would probably need to catch a ride across on a fishing boat or canoe. There is no where to buy food on Batanta or Salawati, so you will need to bring everything you need from Sorong. You will also need to bring more than you need (especially rice) as you should expect to feed your guides and anyone else from the village that visits you during your stay. The village can provide someone to cook your food for you if you ask. Here is some info on a relatively budget option to see Wilson’s and Red Bops on Waigeo. Access from Sorong airport: First proceed to the Raja Ampat ferry harbor. Taxis were IDR100k and ojeks IDR50k, but it was much cheaper to take the yellow angkots plying the main road just 100m from the airport door. You had to take a first one to the “terminal”, and then a second one to the ferry harbor. The ferry would depart at 14:00 and take about 90minutes. 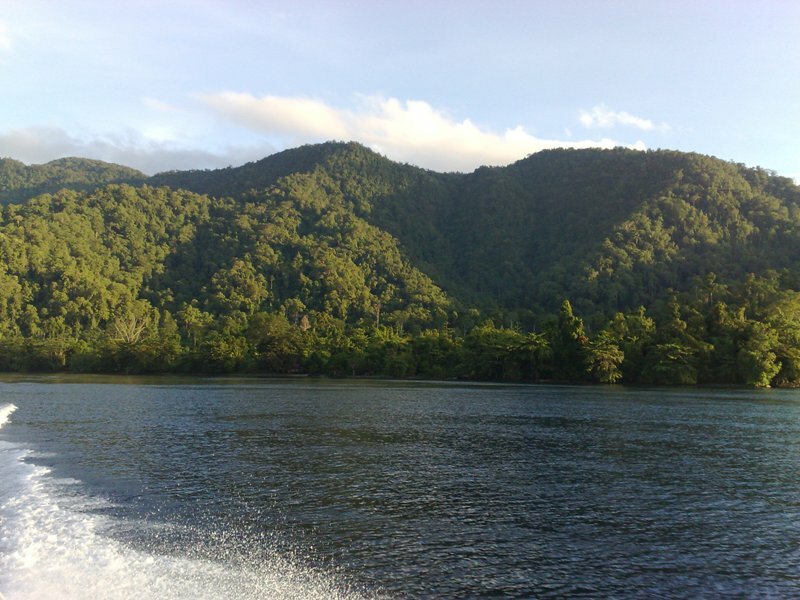 The Raja Ampat tourist initiative has a very up to date website with the ferry schedule. In Wasai, I took an ojek to the Yengkangkanes guesthouse (asking price IDR100k, 15 minutes). 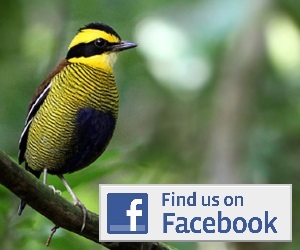 Accommodation: Yengkangkanes homestay or the neighboring Warimpurem homestay are the best choice for birders because the family that runs them owns the land where the target birds occur. Their room & board formula is a hefty IDR350k. There were roaches in the stilt house over the water where I slept but otherwise it was certainly the best-looking accommodation I had during the trip, with splendid turquoise sea views and good snorkeling and luminescent plankton right off the door. Important: Except if you are a big party paying extra, expect nothing to happen on Sundays. Other fees: IDR200k to use the Wilson’s BoP hide and IDR150k to go to the Red BoP place. Going to the mangrove or islet for crowned-pigeons with a small boat was IDR1000k for up to three people. There is a national park fee of IDR1000k for foreigners that guesthouses are supposed to check the receipt for. Birds: The main draw is the two BoPs, both of which were a mere formality during my visit. Red BoP displays in both the morning and evening, Wilson’s BoP mostly in the morning. Note that there are several hides for the Wilson’s, so if several birder parties are around you can ask to visit one of the furthest hides. I did that and got out-of-this world views of the full display, from the second hide where the bird was clearly less disturbed… Birds could also be seen away from display areas but they were very mobile. 1)	Western Crowned-pigeon occurs in the Wilson’s BoP general area but is quite rare and very flighty (they are most likely to disappear in the canopy as soon as they spot you). Arnold (family patriarch) has a spot on a small island for them where they are not hunted. Unfortunately despite asking to go within minutes of arriving and repeating my request every day, they were too busy with other guests and clearly I was not their priority. In retrospect I should have allocated 5 nights to Waigeo instead of a mere 3 nights. In any case I got the crowned-pigeon on my last morning during a guerillero style expedition in the hill immediately behind the guest house. 2)	Pheasant-pigeon occurs in the higher elevations. I got a singleton during above mentioned guerillero expedition which might be a very rare occurrence. 3)	Palm Cockatoo, Hook-billed KF, Rufous-bellied KF, Claret-breasted FD, Pale-billed Scrubwren, Glossy Manucode were all seen within 200m of the guesthouse. Eclectus Parrot and Pinon Imperial-pigeon were super common. 5)	The access road should not be neglected: Brown-headed Crow, Gurney’s Eagle, Pygmy Eagle, without even trying!! 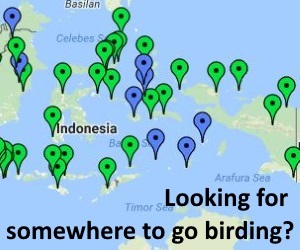 6)	A scattering of small island specialists were seen near the guest house: Island Monarch, Moluccan white-bibbed FD, Spice Imperial-pigeon (in flight far at sea). These and a couple others are reputedly easy in the crowned-pigeon island. 7)	The ferry between Sorong and Waisai is fast but I still managed an awesome record on the way in (almost nothing on the way out): Heinroth’s Shearwater (1), plus Bulwer’s Petrel (4 initially IDed as storm-petrels :-S). These species were attending the outskirts of a feeding frenzy with Lesser Frigatebird, some tuna sp. and some dolphin sp. (maybe long-nosed common dolphin, I really did not look at them given the occurrence of small dark shearwaters in the area…). On the way out short-finned pilot-whales and some Tursiops dolphins were seen as well as a Pomarine Skua.